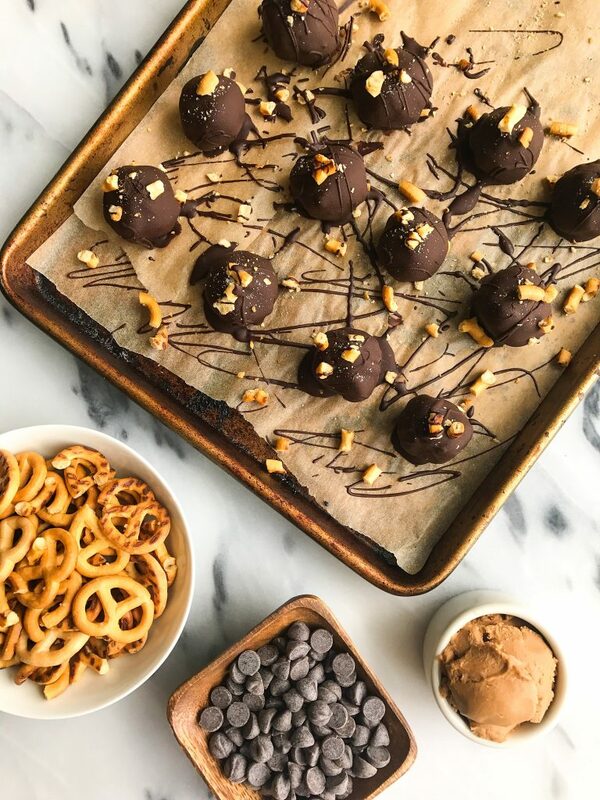 Simple and Easy Dark Chocolate Coconut Butter Pretzel Truffles that are gluten-free! If you invite me over for the holidays, there’s a 99% chance I am bringing some type of truffle along with me for dessert. 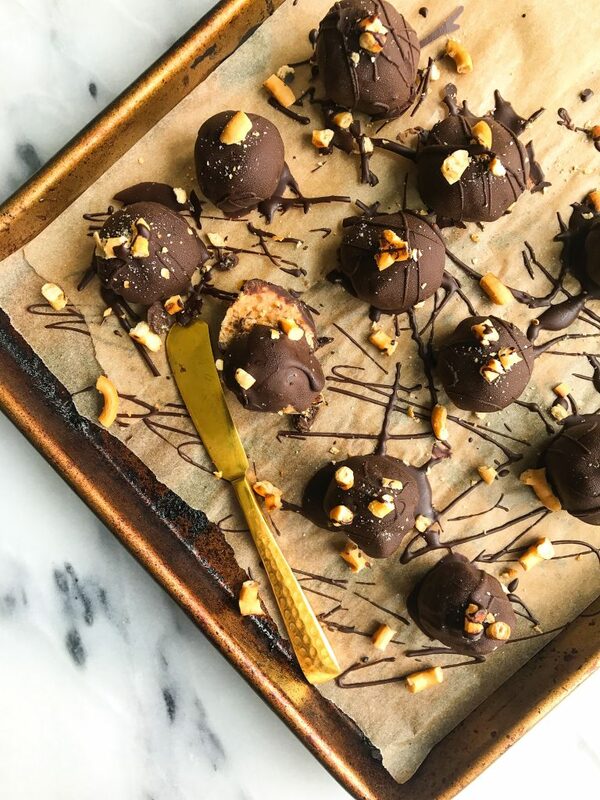 I love making chocolatey truffles and they are always a crowd pleaser at dinner parties and over the holidays. I am someone who wants dark chocolate of sorts after dinner so when there isn’t any served, I end up going home and eating some anyways. Anyone else a complete dark chocolate addict?! Bringing truffles ensures that our craving will be satisfied, and there are so many truffle possibilities (see all my truffle recipes here!). These Coconut Butter Pretzel Truffles though are my recent favorite. They are sweetened with dates and are made of simple and easy ingredients. Plus the salty pretzel flavor and crunch on top compliments the sweet chocolatey flavor so much. 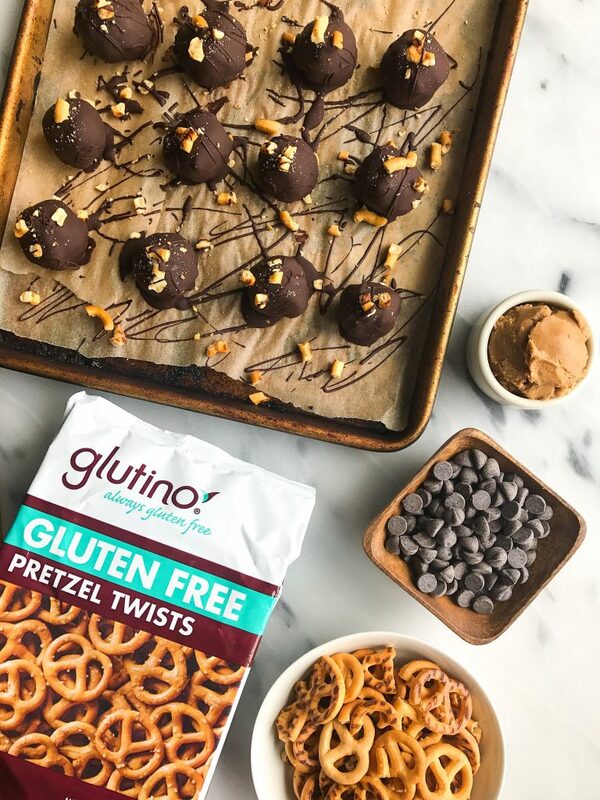 I use Glutino Gluten Free Pretzel Twists in these truffles and they are so good! Glutino makes all gluten-free products like cookies, flours, chips, anything! I love finding unique ways to use their products in recipes to switch up how you enjoy all of their goods. Now it is time to make some sweet and salty Coconut Butter Pretzel Truffles! If you have leftover chocolate, double dip the truffle or save for another recipe! Thank you Glutino for sponsoring this post. It means so much to me to work with brands that I love and who support rachLmansfield! I am allergic to dates, do you have any suggestions for alternatives? I love the combo of coconut and dark chocolate, one of the best, really!! Thanks for sharing the recipe! Yum!! This looks so good! I’m all for bringing easy truffles to parties. You should make a a pumpkin version too for fall:) I’m the annoying lady who finds that thing that works for her and brings it to EVERYTHING.